I remember being a small child and going to the hair salon with my mom. Megs and I would sit there patiently (well as close to patiently as possible) while my mom had her hair washed, cut and styled. As Megs and I sat and attempted to stay out of trouble and not fight with one another I remember watching all the other ladies come in and out of the salon. Each one of them seemed to carry a very large bag and it always intrigued me. Coming across the Longchamp Roseau Crocodile-Embossed Leather Tote instantly reminded me of those very bags I just described. I actually have nothing negative to say about this bag; I actually like it quite a bit. This is absolutely one of the best bags with this kind of inspiration I’ve seen in quite some time. With the holiday season right around the corner, it would also be a great bag to throw over your shoulder while you run in and out of stores. 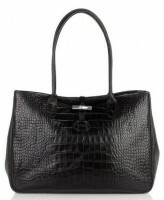 Black crocodile-embossed leather is perfect for the office, shopping or as your tote during the weekend. The silvertone hardware offers just a hint of shimmer against the shinny black leather. You don’t need me to tell you that the bag has ample storage space, but it does. One last thing, take a second look at this bag, it transcends generations. Just about anyone can carry it and it will look fabulous! Buy through Bloomingdale’s for $460.